Tucson suffers massive snowstorm! Snow accumulation up to 2" and even more in the mountains. No kidding! The news people really said this, along with the school closings list. Here at the Newcamerareview.com southern command post, I received about 2" during the night and by 9am it was nearly all melted. A few bridges were slick early in the morning but that was about it. If you want to see some pictures of a real desert snowstorm that happened last week, just click here. 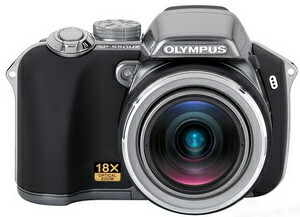 Olympus announced a pile of new cameras today, one of which sparks my interest. It's been cold and cloudy the past couple of weeks with a little rain thrown in here and there, so no new colorful photo gallerys to present. If you'd like to waste some time, follow the link for a few photos. Look at my new-old-toy. It's a Zeiss Ikon Ikonta 2-1/4 X 2-1/4 (6cm X 6cm) rollfilm camera. This very camera was carried by my Dad in the Korean war. The camera was purchased in 1953. Soon, I'll post a few shots from that era, then a few from my era, also I'll be checking on the resolution to see how it compares to my digital SLRs. Click the picture on the left for a bigger view. Finally! The Nikon D40 full review is done and ready for you to scrutinize. This little camera performed well, and comes with a surprisingly good kit lens. Nikon left out a few items that would've really been handy; read the conclusion for my rant. I guess you can't have everything, but you'll get more than you can use. Go here to check out the concise review.